The New York Times bestselling final volume in the Pope’s Jesus of Nazareth series, detailing how the stories of Jesus’ infancy and childhood are as relevant today as they were two thousand years ago. In 2007, Joseph Ratzinger published his first book as Pope Benedict XVI in order “to make known the figure and message of Jesus.” Now, the Pope focuses exclusively on the Gospel accounts of Jesus’ life as a child. The root of these stories is the experience of hope found in the birth of Jesus and the affirmations of surrender and service embodied in his parents, Joseph and Mary. This is a story of longing and seeking, as demonstrated by the Magi searching for the redemption offered by the birth of a new king. It is a story of sacrifice and trusting completely in the wisdom of God as seen in the faith of Simeon, the just and devout man of Jerusalem, when he is in the presence of the Christ child. Ultimately, Jesus’ life and message is a story for today, one that speaks to the restlessness of the human heart searching for the sole truth which alone leads to profound joy.This is a story of longing and seeking, as demonstrated by the Magi searching for the redemption offered by the birth of a new king. It is a story of sacrifice and trusting completely in the wisdom of God as seen in the faith of Simeon, the just and devout man of Jerusalem, when he is in the presence of the Christ child. Ultimately, Jesus' life and message is a story for today, one that speaks to the restlessness of the human heart searching for the sole truth which alone leads to profound joy. No one can take the best that some modernist researchers have to offer and turn it to the service of orthodoxy better than Benedict XVI can. It is brilliant as well as easy to read, and the translation is lucid. I read it twice! It makes for great advent reading. Inspiring and informative. Guilty confession: I haven't read the other two Jesus of Nazareth books. I wasn't sure I was smart enough or had enough brainpower to spare. Well, this was the one to start with, and Advent was the time to read it. It was a gentle examination, a quiet visit in the stable, and an education that wasn't forced. Reading it made me look differently at the Infant Jesus in the manger (and, in the case of my house, in the tractor wagon). 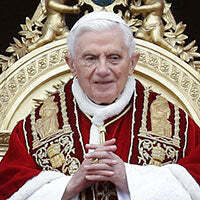 Pope Benedict is a brilliant scholar, no doubt about it, and you can tell that from his writing. Take out, though, any thought you have of not being able to follow his reasoning. This book was beautiful and truly a lesson in all sorts of things for me. I loved it, and I'll be rereading it and sharing it with many others, I'm sure. Pope Benedict provides the ultimate dissection of the bible with this 3 book series, as he makes brilliant connections between the old and the new testaments. As he states, the focus of his entire work is to vividly answer the question “Who is Jesus of Nazareth?” The answer is much more involved than you might think! Probably the only frustrating part of the book occurs whenever Benedict gives time to the theories of other exegetes, of a liberal persuasion. But there is a payoff--- he does this to inevitably to explain how their theories are misguided and wrong. This leads to my favorite line in the book: “Here, theory predominated over listening to the text [Scripture].” In other words, Benedict is saying in a heroically humble and gentle way that these crazy liberals don’t even bother referencing the Bible to support their theories. My favorite section of the book was definitely the area on Jesus’s temptations in the desert, and how each of them teaches a valuable lesson to us – how each temptation is emblematic of very broad, very pervasive temptations that we all experience. These books are an absolute treasure!